Tuesday, June 3, 2014 at 6:30 p.m.
Tuesday, June 3, 2014 at 7:30 p.m.
Join us on Tuesday, June 3 at 6:30 p.m. at Crystal City Hall for an announcement of SUCCESS in the case of Sgt. Robin Erkenbrack, one of two whistleblower Crystal police officers. Afterward, come on down to Pub 42 at 7600 N 42nd Ave, New Hope for a victory celebration and retirement party for Sgt. Erkenbrack, who served the community for over 27 years. We will also be saying our goodbyes to the Erkenbrack family, who is moving to Colorado at the end of June. Finally, we will recommit to the struggle for justice for Ofc. Alan Watt. Now that the weather is warmer, the effort to get our charter amendment on the ballot that would require police officers to carry their own professional liability insurance is really heating up. We have more than a third of the signatures we need. The deadline for signatures is July 3rd and we need YOUR help to get there! While we need lots of volunteers, we are also able to offer payment to some petition gatherers--see below. 1) Friday, May 30 at 6 p.m. corner of Bloomington and Lake, Minneapolis Rally and signature gathering with our coalition partner, Asamblea de Derechos Civiles. We will pair a Spanish speaker with an English speaker to collect signatures in nearby neighborhoods. 2) Saturday, June 7 at 10:00 a.m. starting at 4200 Cedar Ave, Minneapolis. Another great opportunity to canvass with our friends with Asamblea de Derechos Civiles. After collecting signatures, we'll return to 4200 Cedar for a nice lunch. 3) The weekend of June 13 to June 15 is jam packed with events and will be a can't-miss opportunity to collect signatures! Please see the websites listed below these events. If you're available to petition at all that weekend, especially Saturday which will be the busiest day, let us know and we will coordinate our efforts. 612-715-8784 or email cfppmpls@yahoo.com to volunteer. Thank you for your support for our campaign to require Minneapolis police officers to carry professional liability insurance. For more information on this effort, see cfppmpls.wordpress.com This effort is being viewed as a model by police accountability activists all over the country. Once this campaign is a success and the policy is implemented, it will undoubtedly have an extremely positive impact. Canvassers are needed to collect signatures to put police accountability measure on the ballot. Flexible hours, some evenings and weekends. Training and materials provided. We pay 75 cents per valid signature plus bonuses. Get paid to help stop police brutality. Call 612-715-8784 or email cfppmpls@yahoo.com. Saturday, May 31 at 9:00 p.m.
Now that the weather is finally warm, it's time to get out there and start watching the cops. Join us for copwatch/know your rights training and then we'll go out to Lake Street to practice copwatch in the area where our late vice president Darryl Robinson served the community for years. Bring a camera if you have one, paper and pen, and wear comfortable clothes and shoes. You'll learn great information about preserving your own rights and the rights of others in this police state. There is no doubt that military culture has an undue influence on our daily lives. We see it in TV programs, billboard advertisements, and even the toys our children play with. One place where it is especially prominently displayed is at our local police departments. $50 million in federal money was spent equipping Minnesotan police before the 2008 Republican National Convention, “which left us facing what many people called ‘Robocops’ in full body armor and clearly brand new equipment,” wrote activist-journalist Nigel Parry in “Rage Against the Machine, RNC Diary Part 3.” Equipment was left behind with police after the convention was over. Since the 1980s, police departments across America have been steadily building their arsenals with weapons and vehicles acquired from military surplus. Many of these acquisitions come from the Department of Defense Excess Property Program, better known as the 1033 Program. Equipment provided to police departments though this program includes grenade launchers, helicopters, assault rifles, vehicles, boats, body armor, and camouflage clothing. In 2011, the Department of Defense gave nearly $500 million worth of surplus to police agencies, more than doubling the $212 million given in 2010. Police officers appear to believe that they are fighting a war, whether it is on crime, drugs, or terrorism. Officers are now being trained to develop a “warrior mindset” and the perception that their lives are at risk with every citizen encounter, despite the fact that policing is a safer occupation than truck driving, farming, or construction work. In fact, about half of all officer deaths are due to traffic accidents and most of those have not occurred while in pursuit of a suspect or on the way to a crime scene. One way we can especially see the militarization of the American police force is in the implementation, growth, and frequent use of the SWAT (Special Weapons and Tactics) paramilitary teams. In 1967, the first official SWAT team was created in Los Angles. By 1975 that number had grown to around 500 teams across the United States . Today there are thousands of these units operating across the nation. 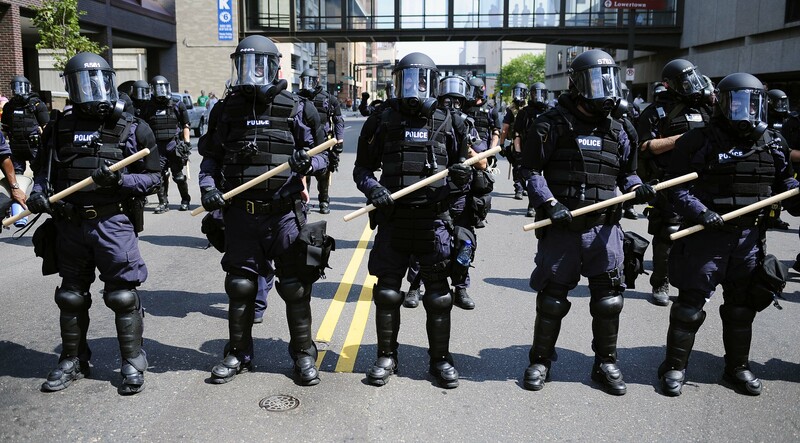 Peter Kraska, a criminologist at Eastern Kentucky University, estimates that over 80% of cities and towns with populations between 25,000 and 50,000 people have SWAT teams and that over 90% of cities with populations over 50,000 have at least one paramilitary police unit. Police, armed and in riot gear and gas masks, in the streets of St. Paul during the 2008 unarmed citizen protests against war and poverty. Often wearing fatigues and body armor while donning military-style assault weapons, these teams conduct over 150 raids every day. In 1980, there were around 3,000 SWAT team raids in the United States. In 2001, that number had inflated to 45,000 and has since expanded to over 80,000 raids per year . SWAT teams have also become increasingly aggressive in recent years. Here are just a few examples. The use of SWAT team operations for minor law violations has steadily risen. During a routine raid in March of 2008 over a low-level non-violent drug charge, a Columbia, Missouri SWAT team violently entered the home of Jonathan March late at night by breaking down the door. Five concussion grenades were detonated around the dwelling, one of which exploded near the feet of a visitor sitting on a couch. As the team searched the residence, two dogs were shot in their backs while the animals were retreating. Only a small amount of marijuana was recovered from this paramilitary operation. During a January 2008 evening raid, a Lima, Ohio SWAT team bashed down the door of the rented home of 26-year-old mother Tarika Wilson in search of her companion on suspicion of minor drug charges. With guns drawn the team entered the house and within moments opened fire, killing Tarika, and wounding her one-year-old son who was shot in the left shoulder and hand and lost his index finger from a police bullet. In May 2010, a Detroit, Michigan SWAT team conducted a late night raid on an apartment through which they had gained entry by kicking down an unlocked door. After deploying a flash-bang grenade, the lead officer in this raid entered the apartment and shot sleeping seven-year-old Aisha Jones in the head, killing her instantly. To make this tragedy even worse, the SWAT team conducted the raid on the wrong apartment. In March of 2013, two SWAT teams shut down a residential neighborhood in Ft. Collins, Colorado, to search for a man suspected of stealing a bicycle and other merchandise from a local Wal-Mart. The suspect was never apprehended. Recently, police departments are acquiring military vehicles such as the Mine Resistance Ambush Protected (MRAP) and the BearCat through the 1033 Program. MRAP’s are 14-ton armored fighting vehicles designed to survive an improvised explosive device (IED) and have been used frequently in the battlefields of Iraq and Afghanistan. The BearCat is an acronym for a Ballistic Engineered Armored Response Counter Attack Truck, and according to the law enforcement website of its manufacturer, Lenco, can be equipped with an M60 machine gun, a 204B machine gun, or a mark 19 grenade launcher. BearCats are used for police and SWAT operations including counter-terrorism efforts. At a cost of around $400,000, these vehicles are designed to be bulletproof, blast proof, and include features such as a C.S. gas (tear gas) deployment nozzle. Over 5,000 of these vehicles have been produced, and are in use by military and law enforcement in over 40 countries worldwide. 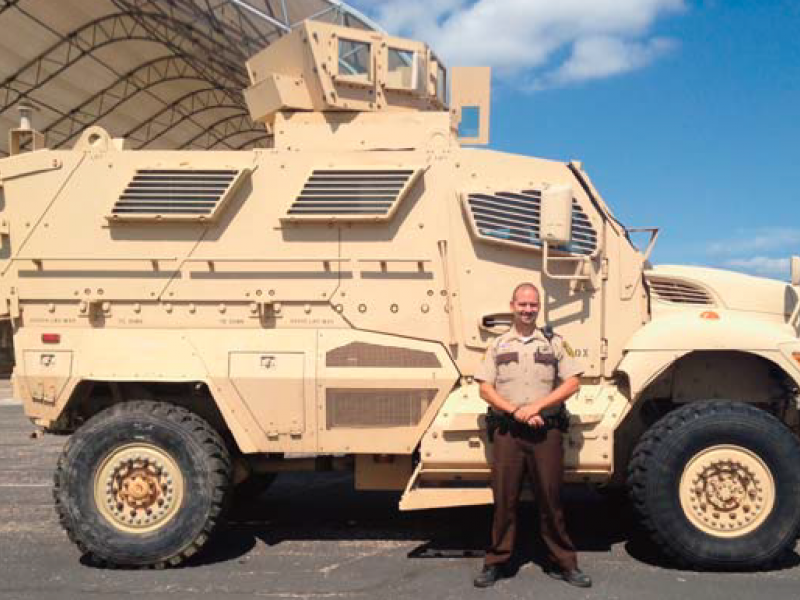 Since the summer of 2013, 165 MRAP vehicles had been acquired by police and sheriff departments throughout the U.S., many by rural police with few officers and little crime. Recently the City of Washington, Iowa, with 11 police officers and a population of 7,000, acquired an MRAP from this program. 731 more MRAP’s have been requested for domestic use, and 780 law enforcement agencies are on waiting lists to receive one. Influenced by this militarization, our police department employees have gone from “peace officers” to “law enforcement officers” and from “protect and serve” to “enforce and incarcerate,” and this has contributed to the U.S. having the highest per capita rate of incarceration in the world. Andrew J. Henderson is active with Communities United Against Police Brutality. In February of this year, he won a challenge in the Ramsey County Court for the right to videotape law enforcement. The ACLU of Minnesota, who assisted in his defense, declared the verdict a First Amendment victory.